Hey all I'm pretty new to the fishkeeping community and im in need of desperate help! I live in bangladesh where the temp is usually in the 30 Cs year long- except for 2 months when the lowest temp goes to about 10-12C. 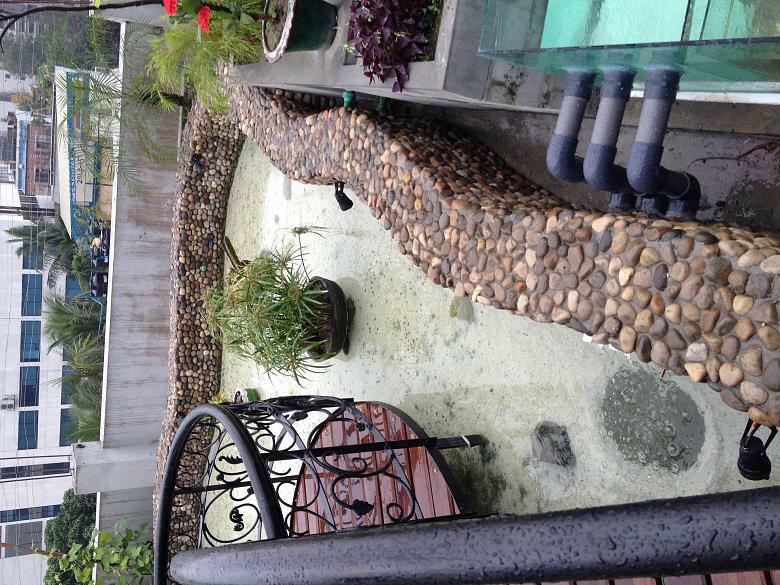 I have a rooftop pond with a waterfall and 6 nozzles shooting water into the pond. Also installed a sump filtration system with UV to maintain water quality. I am in the process of planting some lillies and lotuses for shade in the water and needed some help in what other plants i can put in or out of the water in pots. Right now i have 2 pots of umbrella palms growing nicely in the water. I kept a few different types of Koi in my pond but I want variety of fish in the pond so i was thinking of switching to Cichlids instead as they are warmer water and hardier fish. I also have about 20 red eared slider turtles and 12 common plecos in there. Any suggestions on cichlid species (south american, african, oscars, angelfish) and also should i keep livebearers (guppies, mollys) to create a natural ecosystem? The pond is an irrugelar oval shape, 350 square feet roughly, only a foot (12 in) deep though after ive put an inch or two of white gravel, so lots of space for cichlids to roam about..... Have some bogwood and rocks/pebbles/stones in it to create caves for the fish and basking area for the turtles. Water quality is very good with an average pH of 7.2 and minimum algae growth till now as its has only been up and running for 3 months. I will upload pictures as soon as i take them in good quality! Your suggestions and knowledge will be highly appreciated! If you did one oscar it should be ok (some are real mean so might not be a good plan). Electric blue acara's are my new fav (only 6 inches vs 13 on an oscar) if you got smaller chilids I think it would be more enjoyable. Livebearers, freshwater shrimp, small chilids all should do quite well. Only go with the big chilids if the pond is big, they will nest and chase off anything that gets close so if you have room for them to make a meter nesting zone, go for it. I would go with a few of the big south american cichlids some thing like the oscar(they might be the easiest to get). As for adding live-bearer to breed I would bet you would have to keep restocking those guys because a oscar would eat them pretty quick. It would be cool to make a full ecosystem but the balance of prey to predator would be hard to balance while the predators are growing is size. I would think the best way to do that would be start the live-bearers so they are breeding good then add the oscar. As he grows he will eat more then you might have to add more live-bearers to keep them going or just feed him pellets to supplement. So I was thinking small freshwater shrimp might go nuts in your pond so that could really boost your ecosystem idea, just make sure the ones you add breed in freshwater. Assuming there are bugs because this is outside. So I would do livebearers and shrimp as your base level food chain, once you get them going nuts then think about the bigger stuff, like warhawk said a bigger chilid will eat alot. That is a pretty nice set up. I would love to have something like that in my back yard. Guessing that glass box on the side with is your sump tank? Like Embouck said get a few shrimp that will spawn so the live bearers could eat and the oscar could eat them. I would think the Molly would be the better choice, because they get bigger. I love my guppies but they are kinda small and it would take a lot to fill up a 12" oscar. Yup that is the sunp tank! I really like the idea of shrimp and livebearers! How about a few snails? Estimated number of initial livebearers and shrimps i should introduce? Is it a good idea to keep a variety of livebearers or only mollies? Last edited by bangladeshpond; 03-04-2015 at 12:08 PM. I don't know snails so I can't give advice on them, I would worry they might climb out but I don't know. On how many live-bearers that is hard to say, but a rough guess here is what I'm thinking. I have read the post from the person that put 30 in a kiddy pool in the spring and had a few thousand at the end of the summer. Now that Oscar will be eating as many as he can catch so you will have to make sure they have a big head start and lots of hiding places. 1. That will be a huge bio load for your filters, it might over load your system. 2. Feeding all live food isn't very health for the fish unless you are "gut loading" the live food. So that means you have to feed the live food a lot so they can be good food. 3. I'm not sure they can breed faster than a oscar can eat. I would suggest setting up a 50 gallon tube and breed guppies or mollies. Feed them well and put a 10-12 a week in the pond for the oscar, Most will get eaten but some might make it and breed on their one but sooner or later he will find them. Then feed the oscar pellets every day and allow him to catch the guppy as he finds them. Not wanting to discourage you but I don't think we can under estimate the ability of the oscar to eat everything. secondly WOW ! 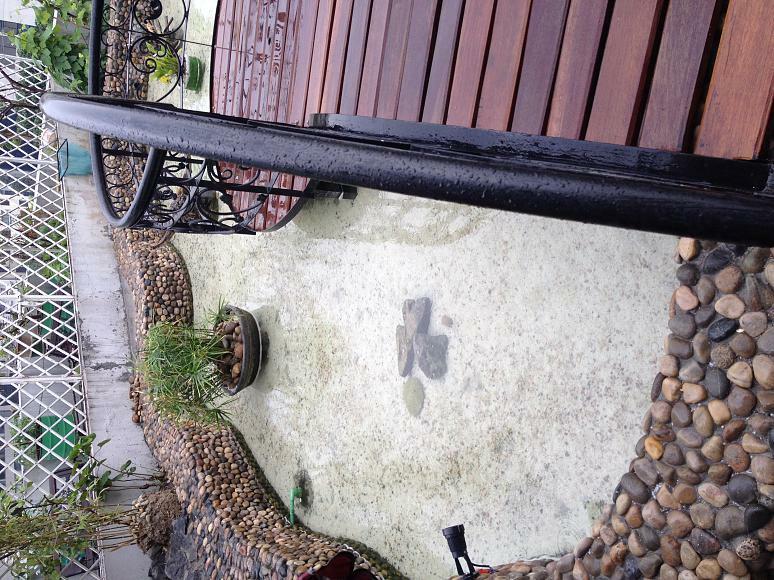 what a wonderful pond you have !